Through encounters on the stands, conferences, keynotes and the Paris Retail Awards ceremony, retail professionals had the chance to share their experiences and discuss the trends in retailing, a sector that is constantly being reinvented. It was also an opportunity for Comexposium to announce new ambitions for Paris Retail Week 2019 and the launch of a One to One event for decision-makers in retail design and customer experience: One to One Retail Design & Tech. the participation of major players: FEVAD, Amazon, Google, Facebook, Alibaba, AB Tasty, Hanshow, JD.com, Fnac, Adidas, Groupe Etam, Monoprix, Rakuten, Intersport, Wonderbox, CDiscount, La Fourchette, La Redoute, Groupe Eram, Rue du Commerce and Saguez & Partners, among others. The 4th Paris Retail Week brought together players in physical and online retailing. "With the key motto Smart Phygital, the meetings and debates showed that the boundary between ‘physical’ and the 'digital' has disappeared. At the centre of these new trends, hyper-empathy has become a vital issue in business," points out Arnaud Gallet, Director of Paris Retail Week. The season's flagship event highlighted this increasingly topical union via the solutions on offer, professional feedback and personal experience. Using digital technology, it is now possible to customise any object (3D printing, engraving, etc.) and enjoy more and more customised purchasing experiences. From the purchasing process to lived experience, consumers are seeking support in daily life for greater ease and comfort. There has been a breakthrough in personal-assistance services, whether online, in stores and now at home. Virtual assistants are now intelligent, thanks to the roll-out of NLP (Natural Language Processing) technologies, and can anticipate our needs and wishes, making our daily lives easier. Paris Retail Week illustrated the conversational era in retailing, with Tiki robots by Event Boots on hand to welcome visitors. The PICOM also unveiled a number of projects currently being developed, including at Decathlon, where the Cube gives customers a chance to experience their favourite sport. Data also proved to be an important trend. “Consumers are looking for customised experiences and are ready to share their data if this leads to an innovative and relevant experience,” said the co-founder of Early Birds at the Google Cloud round-table. Another trend, the early signs of more ecological retailing, is now emerging, and visitors were introduced to several paperless projects, such as the new till receipts from the supermarket Auchan. These receipts can now be sent by email accompanied by nutrition-related tips and tricks and recipes. As a real source of inspiration, the event also welcomed international participants from China, Japan and the US, who set out their vision of online retailing: JD.com presented its “retail as a service” approach, while Alibaba and Hanshow outlined the future of new forms of retailing…Also taking part were Takashi Okutani, the Executive Officer at Oisix, Olivier Saguez, the famous designer who needs no introduction, Brendan Witcher, the widely recognised analyst at Forrester, and Chieh Huang, the co-founder of Boxed.com, to name just a few. Visitors could also find out about the strategy and creativity used by brands to attract customers and maintain loyalty at sales outlets. These included, among others, Salomon, Aroma Zone, Nocibé, Nature & Découvertes, Leroy Merlin, Biocoop Dada, Drugstore Parisien, and the H&M and Bande à Part flagship stores. The 10 prizes given at the Paris Retail Awards ceremony once again provided an excellent shop-window for innovative companies, helping them to make high-potential contacts with participating firms. SMARTLY.IO and its Video Template Editor solution was selected in the Customer Experience category (360) while SELLERMANIA was chosen in the Technology category for its Marketplace management solution. The CRM prize, from the Lead to the client, was awarded to NOTIFY, with their new real-time and AI solution, helping to boost conversion rates by detecting the best time to contact clients. "The award has brought recognition for our BestTime innovation, which not only gives brands a high transformation rate, but also a respectful and personal customer relationship," said Franck Lhuerre, CEO at Notify. The Jury's Favourites prizes went to MERITO for its recruitment platform and to CAPITALDATA for its Tourist Tracker solution dedicated to overseas visitors, while the French Initiative award was given to ANGUS.AI for its Pogkeeper solution, enabling retailers to keep track of shelves in real time. ANGUS.AI was also presented with an award in the Digitisation of point of sale category. Lastly, the Rookie Of The Year prize, given to start-ups for innovative and promising innovations, went to MERITO for its recruitment platform, aimed at pooling employees between stores. REVERS.IO, won the 'Winner of the Winners' prize, the Paris Retail Golden Award, as well as the Logistics prize. "These prizes express a real change of mindset regarding the importance of reverse logistics in the online and offline retail sector," noted Vincent Torres, CEO at Revers.io. The fourth trade show has only just ended, and the 2019 event is already much awaited with a new presentation and new ambitions in terms of simplicity, clarity, accessibility and efficiency, with practical solutions and the same great atmosphere. 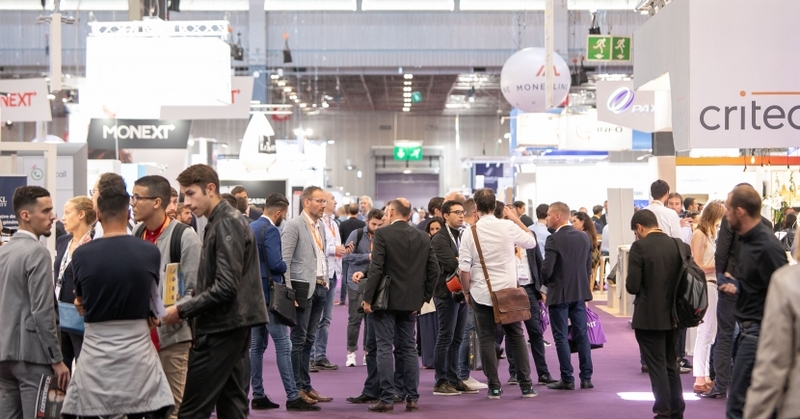 Paris Retail Week 2019 will bring together professionals in digital retailing and marketing in a new, more experiential format from 24 to 26 September 2019, at Paris Expo Porte de Versailles. The participants will be taking a fresh look at today's digital issues: devising a flexible and agile customer experience, incorporating the new means of payment, adopting durable logistics, optimising the use of marketplaces, redefining the marketing approach, making the best use of data, managing multi-channel sales, etc. Paris Retail Week 2019 is set to be the festival of online retailing, providing visitors with a unique and original experience. An awards ceremony, retail tours and live concerts will add dynamism to an event designed to share knowledge, experiences and best practices, while placing a different business theme in the spotlight each day, and all in a lively atmosphere including special events. At the very heart of the trade show, a Forum area will give exhibitors a chance to make their sales pitches, and will include daily themed challenges open to all the participants. The 2018 trade show also saw Comexposium announce the launch of a new One to One event dedicated to business, inspiration and networking between experts in Retail Design and customer experience in a city that has become the epitome of dynamism and was voted the world's most trending city: Bordeaux. One to One Retail Design & Tech in Bordeaux (at Hangar 14) on 7 and 8 October 2019 will bring together over 200 decision- makers in store layout and design, POS marketing, in-store digital technology, the retail concept, architecture, merchandising and customer experience. "Everywhere, stores are being redesigned in the light of customer experience and design, and points of sale are being enhanced by the use of digital technology. At the same time, brands and stores need to take into account consumers who are increasingly hard to pigeonhole. In this process, One to One Retail Design & Tech is a new event for professionals seeking the inspiration to create tomorrow's retail outlets today, and who are looking for effective ways to find the right business partners," says Arnaud Gallet, the director of the new event. As a real source of inspiration for professionals attending the event, One to One Retail Design & Tech will feature one-to-one meetings with suppliers, presentations by sector experts who have made decisive contributions in France and overseas, and inspirational conferences focusing on the decision-makers' preoccupations. During this 100% key account and 100% ROI event, networking will not be forgotten, with 2 lunches and 1 evening event to continue the conversation in original settings and a friendly atmosphere. 45 partner service-providers (design agencies, interior designers, innovative equipment suppliers, point-of-sale digitisation solutions, architecture firms, design studios, POS advertisers, etc.) will be selected after applications made to an Editorial and Strategic Committee and will be offering professionals with the best business solutions. This is scheduled to be a not-to-be-missed annual event, and is already available to partners via two packages, including appointment scheduling, passes for staff and for guests. All Paris Retail Week press releases and pictures are available on the Digital Pressroom. *Bordeaux: The city voted the most "trendy" in the world according to Lonely Planet 2017.